The carved wood and gesso mirror frame retains the original gilding and consists of a broken scroll arched pediment with carved eagle heads and foliate decoration with cresting to the centre and architectural decoration below leading down to a moulded edge and carved frame terminating with a shaped and foliate carved apron below with central carved roundel decoration. The mirror retains the original double bevelled mirror plate panels, the glass having been re-silvered at some time and being in very good condition. The mirror has pine boards to the back with hanging chain. John Belchier was a cabinet maker recorded near St Pauls' Churchyard in 1717 and supplied various pieces of furniture to his clients including gilded tables, pier glasses and bureax. From 1720 he supplied John Meller at Erddig in North Wales (now a National Trust property) luxurious furniture including a pair of pier mirrors, a mirror topped table and a gilded state bed with hawks head decoration. 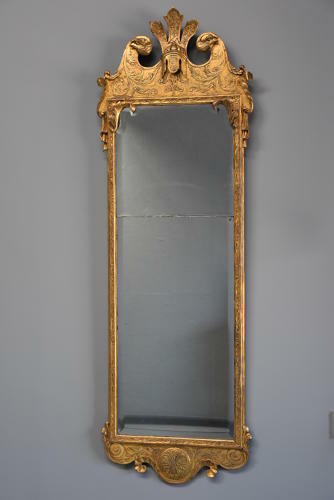 This mirror is rare due to the size and it retaining both the original gilding and original plate.